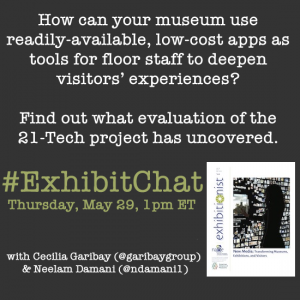 Please join a Twitter chat hosted by NAME: National Association for Museum Exhibition this Thursday, May 29th from 12-1pm Central, 1-2pm Eastern at #ExhibitChat. The focus of this chat will be on how museums can use mobile devices to deepen visitor learning. This is also a great opportunity to get app recommendations and share some of your favorite apps to use with museum visitors.